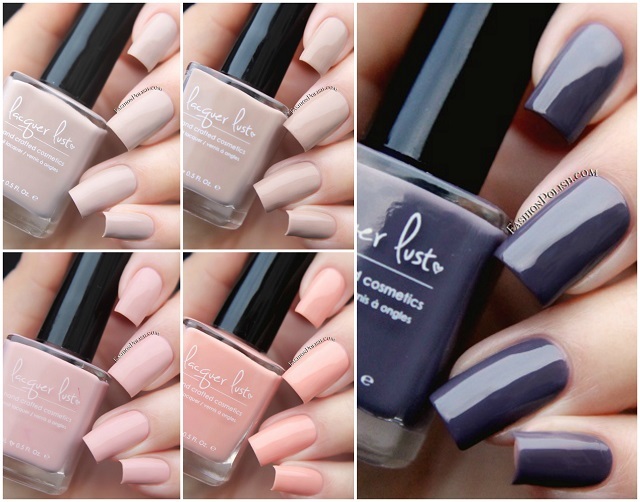 Fashion Polish: Lacquer Lust Au Natural collection review! Lacquer Lust Au Natural collection review! Taking a break from heavy shimmers and holos, I have the Lacquer Lust Au Natural collection to share with you all today. Featuring 5 neutral cremes, the perfect palate cleansers or base for nail art. Application was simply flawless on the entire collection. Nice and easy 2 coaters, each coat delivering optimum pigment coverage and smoothness. Pictures all taken in natural daylight, in the shade. Milk Tea is a pale creamy beige. Cafe au Lait is a warm nudie taupe-beige, just a tad darker than Milk Tea. Dusty Rose is a soft grey hued baby pink. Apricot is a subdued apricot pastel. Earl Grey is a creamy grey with strong purple under stones. The Lacquer Lust Au Natural collection has been restocked on lacquer-lust.com today along with the Fall Harvest cremes and retails for $9 each (international shipping available). Make sure to follow Lacquer Lust on Facebook and Instagram for sneak peeks and restock info on Facebook and Instagram.